we had a little get together with our neighbors last night…that ended up be the un-get together. so sad! we had been planning it a little over a week, and even confirmed and reconfirmed…when 7, 7:15 and 7:30 rolled around, we got a little worried. about 7:50 we started eating, and at 8:45 the doorbell rang. one of our neighbors ended up bringing a gorgeous cheesecake and 1/2 a loaf of banana bread that he had made. they were both SO tasty! we never got a straight answer for the nonattendance, but we were really touched by these amazing treats! i think we kind of realized that, you know, our circle of friends that we regularly have over, are people we work with or go to church with…aka people we see every single day. although we (i) have been building relationships with these guys for almost a year…we definitely don’t interact every day and will go weeks without seeing each other. i think it sort of dawned on us that, especially in our neighborhood…people are really skeptical, and it might have been a big deal to actually show up and show trust in being invited into someone’s home. the truth is, they DON’T know us. kind of sobering. we hope to have them all over to the new place, as we are running short on time. totally a crazar evening, and hoping that they will welcome our continued outreach. i picked up the flowers yesterday at whole foods for $4, and already had the dried beans (about 60 cents in bulk at whole foods). i just used two drinking glasses from my cabinet, and voila….a cheap, but fun, centerpiece! 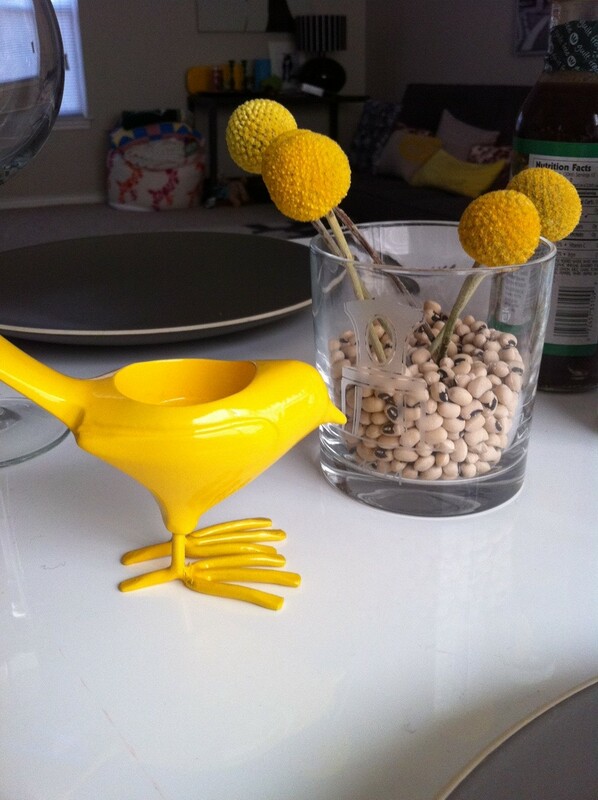 i paired them with some yellow bird tea light holders (love!). we were totally set.